A new law will require certain cities to get the consent of a majority of property owners before annexing their land. DALLAS COUNTY — On a recent afternoon, Michelle Singleton played with her dogs behind her house. The pets' barks and the chirps of crickets were the only sounds on the 15-acre property, which Singleton and her husband, Stan, bought more than 30 years ago. There, outside the North Texas city of Mesquite, they have hosted bonfires, hunted doves and watched their three children grow up. But now, Mesquite plans to annex their land, and the Singletons are afraid it will ruin their way of life. Mesquite is among several cities across Texas, including McKinney and Pearland, that have tried to annex land before a new law goes into effect Dec. 1, requiring certain cities to get the consent of a majority of property owners before annexing their land. City governments have said they are responding to the needs of urban growth and normal development. But residents say they just want to be left alone. "We’ve survived this long without them," Michelle Singleton said of city officials. "And we don’t need them to survive now." City officials in Mesquite and Pearland acknowledge the law has rushed their annexation plans but say annexation had been on their radar long before Gov. Greg Abbott signed the bill into law in August. Mesquite Mayor Stan Pickett said developers who own land outside the city asked early this year to be annexed in order to provide city services to future subdivisions. Mesquite City Council members added that the annexation was aimed at controlling inevitable development in the area, not taking over current residents’ homes. The city has dramatically reduced the amount of land under consideration for annexation in response to the negative outcry from private landowners. 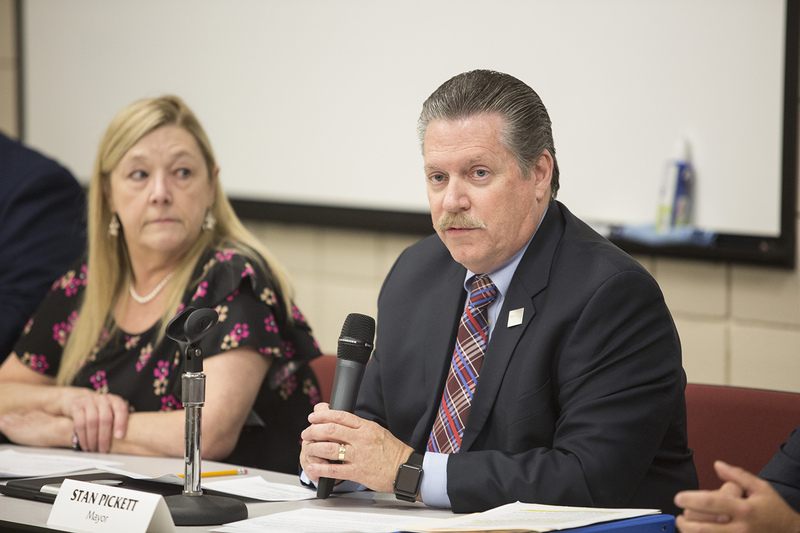 During an Oct. 26 public meeting, Mesquite City Council member Bruce Archer said if he could annex land without any independent homes, he would. Pickett said Mesquite has reached out to residents, offering city staff to help them navigate the annexation. But state Rep. Lance Gooden, R-Terrell, a House sponsor of the new law, Senate Bill 6, said he and his constituents in Kaufman County would not negotiate with city hall because “they don’t have anything we want.” Gooden said the point of the measure — which applies to cities in nine of the state's most populous counties, plus Henderson County — was to protect Texans who do not want to be annexed by neighboring cities. In the Houston area, Caye and Gerard Hauser are in a situation similar to the Singletons'. The couple first moved to a plot of land outside of Pearland almost 40 years ago to escape the city and start afresh. They, like most of their neighbors, started with a small mobile home on a few acres and eventually constructed a house. Like the Singletons, the Hausers have raised their children on their land and hope to pass it on to future generations. Caye Hauser said they also have livestock and fear annexation could force urban codes on a rural setting. Residents around Mesquite have similar concerns over potential city regulations. At the city council meeting about annexation last month, property owner Mack Beam said that after his land was annexed into Mesquite 11 years ago, officials cited him for violating codes based on "city living." “Within 72 hours after we were annexed, we got our first heaping helping of city services, which were code enforcement people coming in up and down the road out there because our hay meadows weren’t cut to suit the city,” Beam said. Pickett said that was before his mayoral tenure and that he has no desire to change people’s ways of life. Pickett added that it’s “just not practical” to enforce the same codes used in the Mesquite city center out in rural areas. In Pearland, however, council member Keith Ordeneaux had a different take. In an email to Hauser’s family obtained by the Tribune, Ordeneaux disputed Hauser’s characterization of their land as “country.” While he said people in annexed areas will have to abide by city codes, prohibiting bonfires and fireworks, he disagrees there will be a serious effects on residents, as the land has already developed into a suburban area. Ordeneaux said in an email to the Tribune that the land had always been subject to possible annexation and the new law simply sped up the process. Several residents have said annexation will increase their taxes for services they will not use. Property taxes for both Mesquite and Pearland are about 69 cents for every $100 of property value, so about $690 per year for the average Mesquite household, in addition to county and school district taxes. Ordeneaux added that areas planned for annexation already receive some city functions, such as fire and emergency medical services, without paying city taxes. The office of Texas Attorney General Ken Paxton has intervened in some annexation efforts. The office sent a letter on Nov. 6 to officials of the North Texas city of McKinney, arguing they did not properly follow state annexation procedure. McKinney has since canceled its annexation plans. Pickett received a similar letter on Nov. 9 from Paxton’s office, arguing Mesquite may have failed to properly notify residents and hold public meetings with sufficient notice. Some property owners said they never received notifications and learned of the annexation efforts through friends and neighbors. Pickett said the city mailed notifications to property owners in early September and posted announcements on its website, as required by state law. Shortly after Paxton's office sent the letter to Pickett, a state district court ordered Mesquite to delay its annexation efforts in Kaufman County. A separate district court ordered the city to delay its efforts in Dallas County, including the Singletons' property. This week, a Texas appeals court denied a request from Mesquite to cancel the order in Kaufman County. A delay could cause the city to miss the Dec. 1 deadline — precisely what residents and Gooden hope will happen. "They say you can’t fight city hall," Gooden said. "But we are, and we’re winning and we plan to win."